"Before Munich, the world had no idea about our struggle, but on that day the name of 'Palestine' was repeated all over the world." The Munich Olympics in 1972 originated with the idea of promoting a new, modern Germany in which all cultures could come together to enjoy peace and harmony. For a decent period of time, this was true, and the athletic events took place in the usual dramatic fashion. No one could have predicted the tense and horrific standoff that occurred on September 5th. When a revolutionary Palestinian group took 11 Israel athletes hostage, they shattered the friendly atmosphere with deadly and mind-numbing consequences. One Day in September brilliantly chronicles this tumultuous day and the events surrounding it through interviews, live footage, and tactical diagrams. Narrator Michael Douglas coldly describes the unbelievable events over startling newsreel footage. Director Kevin McDonald (Donald Cammell: The Ultimate Performance) keeps the story interesting by covering all sides of the issue, including the police, the loved ones of the hostages, and the one surviving terrorist. Intercut with exciting live footage of the Olympics, the contrast between this athletic energy and the violent standoff is startling. The gruesome, disturbing details stand apart from the ideals of the Olympics and placed a dark cloud over this event forever. The two central interviews of this documentary reside on completely opposing ends of the spectrum. Ankie Spitzer was the wife of Israel fencing instructor Andre Spitzer - one of the victims in the hostage crisis. While the events play out on screen, she explains her thoughts during each moment with forthrightness and courage. It must be extremely difficult for her to relive those torturous moments, but Spitzer does a nice job in openly revealing her feelings of frustration and concern. The other main interview comes from Jamal Al Gashey - the lone member of the terrorist unit who remains alive. From an undisclosed location, he still hides from discovery by Israelis seeking revenge. Gashey's comments reveal a thoughtful person who understood the nature of their assignment, but believed it was necessary for their cause. Even today, he believes it was the proper action and shows no remorse for the violence used. It starts at a fairly slow pace and sets up the later events with precision and depth. This documentary contains an extraordinary amount of research, and it helps to provide a complete picture of this fateful day in 1972. This is especially prevalent during the final airport standoff, where impressive diagrams move step-by-step through the disastrous events. The concluding half-hour is nerve-wracking and unbelievable, even though the circumstances are well known and documented. The consistent ineptitude of the German forces is explained without being too critical or preachy. MacDonald simply presents the facts in a clear manner and allows them to speak for themselves. I was not even alive in 1972, so my knowledge of the Munich Olympics and this incident is limited to the basic information. 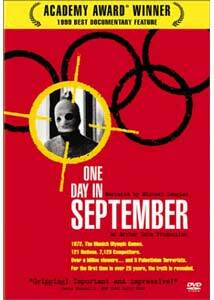 One Day in September provides an excellent look at this dreadful tragedy in nearly perfect fashion. One slight drawback to the presentation is the limited amount of titles listing who is speaking during the interviews. This makes it slightly more difficult to follow the thought processes associated with the words being spoken. However, the pace of this narrative creates an impressive, linear timeline that keeps the event understandable. This documentary is a must-see to educate young people like myself and remind those who lived through it of this difficult time and what it portends. It contains startling images of hatred, violence, and callous disregard for human life. Image Transfer Review: A large amount of footage in One Day in September springs from documentary material filmed in 1972, so it contains the expected high level of grain and defects. This is usually not distracting, although due to the poor picture quality, a few scenes are difficult to comprehend. The modern-day interviews and footage appear fairly clear with only a little grain and virtually no blemishes. The 1.78:1 anamorphic widescreen transfer lacks the clarity of the most pristine transfers, but succeeds for the most part. The black levels are solid and the images are bright and clear during a majority of these scenes. Audio Transfer Review: Although this material is fairly quiet and concentrates primarily on dialogue, the 2.0-channel Dolby Surround is impressive. The diverse musical soundtrack plays nicely through the two speakers, and the roars of the crowd during the Olympic scenes bring the events to life. When gunshots fire through the extremely clear transfer, the full force of this violent reality jumps off the screen. The sounds and music in this documentary are very well done, and this excellent audio transfer supports their success. Extras Review: The lack of significant extra features on this disc is not surprising, due to the nature of this documentary. It stands alone fairly well, and needs little further explanation of the events that took place. However, it would have been nice to see an interview with director Kevin MacDonald or producer Arthur Cohn about their reasons for doing the film. This disc does include brief talent files for MacDonald, Cohn, and narrator Michael Douglas. Each entry contains a brief list of awards and a selected filmography. It also has bonus trailers for Anne Frank Remembered, Central Station, and Savior. All three are presented in decent transfers, although only the preview for the documentary, Anne Frank Remembered, comes in a widescreen format. One Day in September received a well-deserved Academy Award® for Best Documentary Feature in 1999, and it represents the pinnacle of documentary filmmaking. Director Kevin MacDonald keeps the story line focused while juggling numerous interviews and news footage. Even if you know the final outcome, this documentary will fascinate you, touch your heart, and keep you on the edge of your seat throughout its running time.